Hi everyone, it's that time again! Hope you are ready for another Stars and Stamps theme challenge. Before we present the theme challenge though let’s take a look at all the wonderful cards submitted for last weeks stash challenge. To see details about their cards or to visit their blogs… please click on their names in the original post. Many thanks to all who played along with us this week! WINNER! 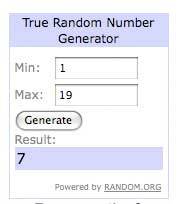 Our blog candy winner was chosen by Random.org - and here you go: #7 was Barb!! Congratulations, your prize will be on the way soon! This week you are going to go wild over the theme challenge we've lined up for you!!! Actually, Tammy deserves all the credit. She thinks up the best theme challenge ideas and we simply post them here on the Stars and Stamps blog for all of you to enjoy! A HUGE thanks to Tammy for all her fantastic theme challenge ideas! This week's theme challenge is the "Wild Thing" and if you are like me, you may be thinking of the hit song "Wild Thing" but this weeks challenge isn't about music. Oh, and let me know when you get the lyrics to that song out of your head, LOL!!! This week's theme challenge is to create any card featuring a wild animal. Some ideas to get you started... think of animals you may see at the zoo, in the jungle or on a safari! While you are humming the tune to the song "Wild Thing" take a look at the goregous card Tammy created to get you inspired. To see more of her amazing creations, stop by her blog, My Craft Central, and leave her some love. To play along in this week's theme challenge, simply upload a project to your blog or online gallery then leave a direct link to your project in the Mister Linky widget at the bottom of this post. When a NEW challenge is posted next week, we'll also include photos of the cards completed before then. If you'd like to create a card for an upcoming mid-week challenge (color, shipper's choice, stash or theme), please send us an email and we'll get you lined up! We encourage everyone to take a few moments to visit the other participants' blogs and leave them some feedback. A HUGE thanks to everyone for doing so! wild thing - do you know how many monkey stamps I have :) But i did see a great giraffe stamp i had forgotten. I just happened to have already planned to post a Circus Elephant card today, isn't that great timing? Great way to use my lion stamp!! Thanks for the great challenge,as always. This motivated me to use some chipboard birds that I picked up last week. I was working on some man cards trying to get some out for fathers day but took a little break to get "WILD"...Of course I used a Monkey...have u seen my blog? I could only find one 'wild' stamp in my stash but I had fun using it in this challenge!